When decorating the windows in your Toronto home, you’re faced with a choice. Do you go with ready-made drapes from a store or get custom drapery especially for you? It can be difficult to know which option will give you the best style, quality, and value for money. If you find yourself in a sea of swatches, completely confused as to what you should go for, don’t worry. In this article, we weigh up the pros and cons of each one, so you can make the right decision. Fine Details – When you get drapes custom made, you can change all the little details to achieve the style you want. The trim, lining, piping and accessories are all up to you. When you get store-bought drapes, you don’t have this luxury. The lining is especially important. Ready-made drapes often have cheaper lining, and when you hang them, you can sometimes find that they don’t block the sun out as much as you want, or that the light coming through them alters the colour. When you go with custom-made, you have complete control. Convenience – The main reason people choose ready-made curtains is because of the convenience. Being able to walk into a store, pick out some drapes and then go home and hang them that very same day is all some people have time for. Although it must be said that for many, it’s not always that easy. Sometimes, it involves multiple trips to lots of different stores. 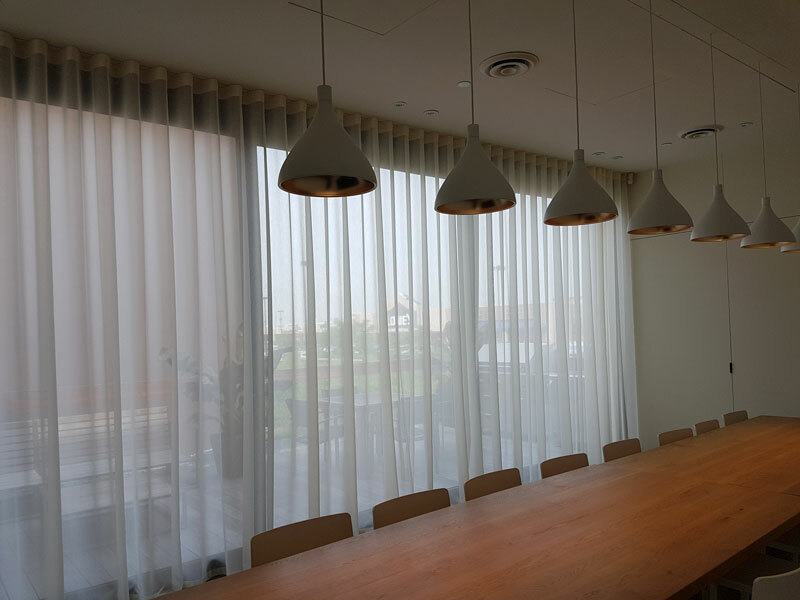 Getting your drapes custom made takes more time and effort, as you’ll have to consult with a designer, have them measure your custom window coverings, agree on a design and then wait for them to make them. However, the results will be so much better and in the end, it will be worth it. Price – This is one area where ready-made drapes come out on top. There’s no doubt that mass-produced curtains will be cheaper than custom ones, but while you’re spending less, you’re not getting value for money. You get what you pay for, and cheaper drapes will have a shorter lifespan. It’s worth investing in custom drapery for long-lasting window decorations. Style – When you’re decorating your home, you want it to look just right. When it’s finished, it will be something that represents your unique tastes and makes an impression on anyone who visits. When you have to look at your drapes every day, you want to be sure that you’re completely happy with them. Finding ready-made drapes which match your tastes, colour scheme and functional specifications is a challenge. While it can be done in some cases, it is definitely not an easy process and can involve a lot of digging through store catalogues. When it comes to style, the only way to get exactly what you’re looking for is to have your curtains custom-made. That way, you can choose the colours, fabrics, patterns, type and accessories to create a look that can only be found in your home. When they’re finished, you’ll have something to be proud of. Precise Measurements – If the windows in your home are standard sizes, ready-made drapes are likely to fit them. However, if you have anything out of the ordinary, even slightly bigger or smaller, you might have trouble finding something to fit them in a store. There are just two main sizes for ready-made drapes, 7 feet and 8 feet, and that leaves you with very limited options. When you buy custom drapes, you don’t have this problem. There’s a world of choice in front of you. Your drapes will be made-to-measure, so you can be sure that they’ll fit your windows perfectly. The designer will even come to your home and measure up your windows beforehand to make sure to get it exactly right. That saves you frantically shopping around and searching for something the right size, measurements in hand. Even if you do find drapes to fit your windows, you still can’t guarantee that they’ll look right once they’re hung. In order to achieve proper fullness, the width of drapes should be 2-3 times that of the window. It’s much easier to leave it down to a designer and go with custom-made drapes. For good-quality drapes that look exactly the way you want them to, custom-made is the only way. Ready-made ones can be suitable for those who are on a tight budget and don’t have a lot of time to spend, but otherwise, it’s better to go with custom drapes. They’ll be unique, long-lasting, and most importantly, just for you. For the best custom drapery design in Toronto, contact Sarit Arnesty @ 647-898-4073.